I recently began a collaboration with Tom Randall from Lattice Coaching and Training. Here is the post which we collaborated on, as well as some of the practical options and considerations which the Lattice Climbing community came up (see the “from Taylor” section at the end) with to help develop provide a direction for additional Rate of Force Development (RFD)-related protocols. Recently we’ve been in touch with Taylor at the Beta Angel Project about a cross-collaboration. We’d noticed that he’s equally as psyched about climbing research as we are! To introduce you to his work we’re going to start on a very popular topic: the rate of force development in the fingers, or what is commonly thought of as contact strength. While this is a relatively new measurement, compared to assessing finger strength, there is some existing work on the subject. Below is a short synopsis of the research. It’s a little over-simplified but hopefully communicates the information. 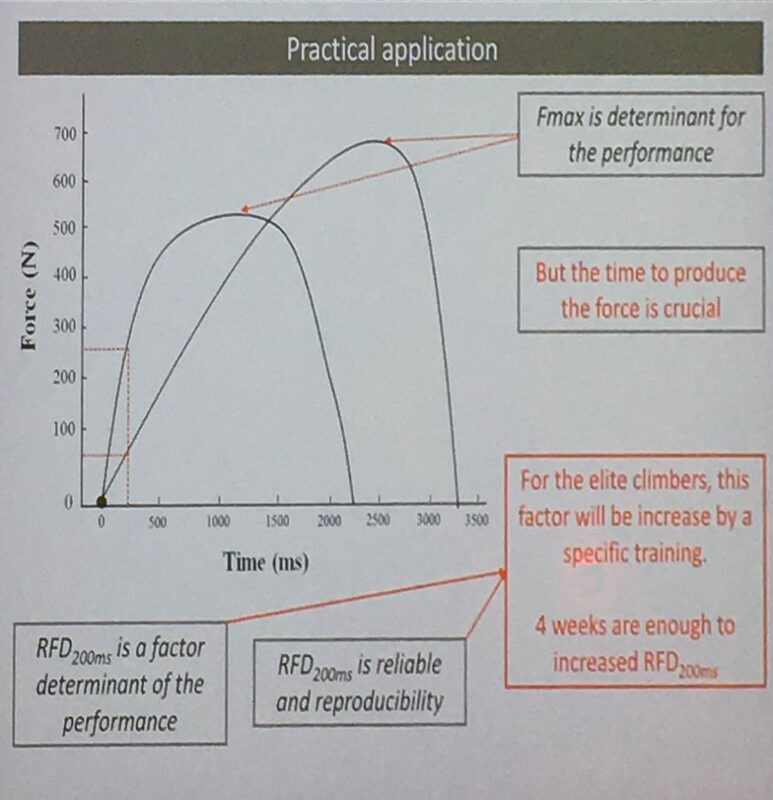 Rate of Force Development (RFD) is a relevant indicator of climbing performance when it is measured later in the contraction phase. At least one protocol has been tested on elite-level Boulderers and was found to be effective. It may be a good measure of fatigue in Lead Climbers, as well as a discriminator of skill level in Boulderers. If you love delving into the details then read on! Researchers have measured the RFD at different points in the contact of the hold. Working with the French National Team they have designed a specific protocol and have found that the measure may have utility in measuring fatigue in the fingers. They have compared how this measure (and other more traditional measures) fare when correlated against climbing performance. They have also looked at how training RFD may transfer between grip types. A collection of the existing research on this subject is available on Beta Angel. From Levernier’s 2018 Conference Presentation. Two articles (Levernier & Laffaye, and Vereide et al.) presented at the 2018 International Rock Climbing Research Association conference in Chamonix, France are not in the inventory yet as they are not available to the public. Both papers looked at different ways of measuring RFD to find out which worked best, such as Average RFD, Relative Peak RFD, RFD at 95% of maximum finger force, and an interval of time blocks between 0-300 ms. They found that Average RFD associated well with performance and that the best associations with climbing performance happened later in the contraction. 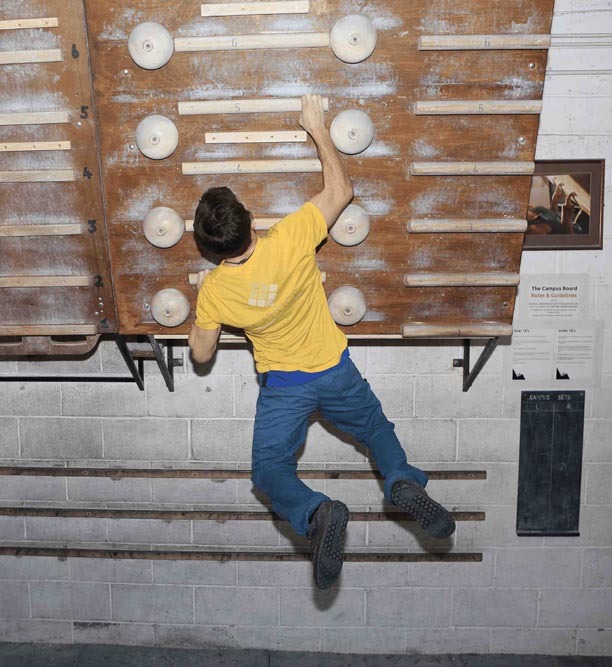 They concluded that lead climbing isn’t a particularly explosive sport when it comes to contraction, but that there are major distinctions between skill levels when it comes to bouldering (possibly more so than finger strength). So what do you think of this research? Where can it go and how can we use it? A few questions Taylor thought we might be interested in: is it worth trying to improve the logistics of measuring RFD and incorporate it into Lattice’s suite of measures? Do you see relevance for it as a measure of fatigue in addition to its use as a measure related to finger strength? Given the relationship with the speed of contraction and other climbing-related injury research suggesting potential associations between shock-loading and injury, he is also curious how the training community perceives the risk (possibly at different skill levels). (1) A hangboarding protocol used on the French National Team which was built and studied by researchers. The Hangboarding protocol from the Levernier/Laffaye research had a 40 minute careful warm-up with time to familiarize themselves with the test edges, and they controlled for circadian rhythm and temperature. It involved a one-arm hang at a 90 degree lock-off. An update from the lead researcher showed me that they trained on two different grip types (open-hand, half-crimp) but measured three: open-hand, half-crimp and a full crimp. The grips were apparently between 25 – 6 mm. If they held for longer than 6 seconds, the researchers would increase the difficulty by changing the hold. If they fell below 120 degrees of flexion in the elbow, the attempt was discontinued. The fact that the researchers appeared to be careful about attempting to monitor and minimize injury, and that this has only been used on elite-level Boulderers, led me to be reticent regarding recommending this particular protocol in the absence of an experienced trainer. The idea of limit bouldering (LB) represented interesting potential. Only doing a handful of moves at your maximum would simulate the 4-6 second max contraction, although it might also increase the uncontrolled nature of the shockloading. Additionally, the community was concerned about measuring it for reproducible results. The community recommended combining LB with a carefully-designed, possibly symmetrical system board which could improve the measurement potential by allowing “control of hold size, move distance, and and problem creation” (Lattice Community Discussion). It could also provide more specificity to climbing. The Lattice Trainers considered the possibility of looking at a force plate combined with a climbing hold. I noted that the researchers of the French National Team study used a “Power Grip Manipulandum” dynanometer. Lastly, we looked at a few of the results of some studies which suggested that RFD may fatigue quicker than maximum voluntary contraction (MVC). One community member thought it may be useful to look at the ratio of MVC to best boulder problem. He/she hypothesized that as an imprecise but potentially suggestive metric: “Climbers with a high MVC but low max send might indicate underlying strength without the ability to turn it on quickly. In those climbers training RFD might be more important. High send, low MVC…might mean more hang boarding to raise MVC, less campus/limit bouldering” (Lattice Community Discussion). It was an interesting discussion. I look forward to more work with the Lattice Training Community.